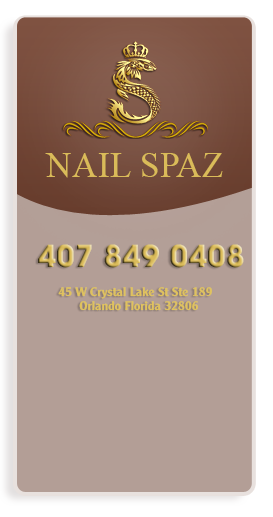 Nail Spaz located in Orlando, FL – with lovely, comfortable, clean and friendly space would help you relax after a long working day. Our skillful, professional and experienced staff would treat you like a Queen when you come to us. We provide a large range of services, such as: Full set, Fill in, Solar nails, Deluxe Spa Pedicure, Manicure, Design, Manicure Gel Polish… (Click on “Services” to have full information about each service and its price). All of the modern tools & equipment would be sterilized after every use to ensure sanitation because your safety is one of our top priorities. Become our regular customer to feel the magic yourselves with up-to-date nails styles and services! Nail Spaz – We are here to take care of your health and your beauty! Copyright © 2015 Nail Spaz. All Rights Reserved.